Wild Studio, a roving educational experience run by Great Plains Conservation, teaches students to become top-notch wildlife wildlife photographers over the course of a single week spent in Kenya's Nairobi National Park, Chyulu Hills, and Masai Mara National Reserve. One writer decided to put it to the test. Check out his pictures (and read his story) to find out how good he became. The Emakoko, a luxury safari lodge, stands by the Mbagathi River on the edge of Nairobi National Park, in Kenya. Although barely 45 minutes from the airport, it's a place of serenity and wide-open spaces. With its heat and thorn trees, you could almost mistake it for an overgrown corner of Georgia or South Carolina, except for the unfamiliar creatures. I had come to learn how to photograph wildlife, and I saw immediately that I wouldn't have to look far to find it. 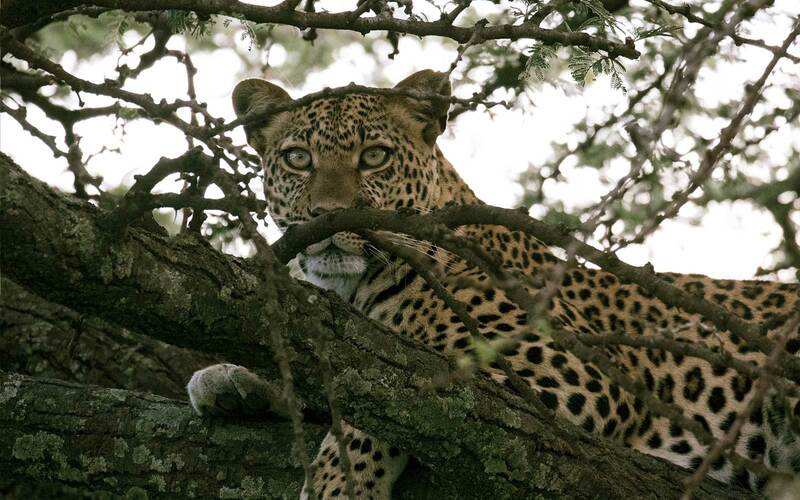 When I arrived at the veranda to meet David Murray, who would be my teacher for the next seven days, I noticed a genet, a tiny feline creature covered with leopard-like markings, lurking nearby. It seemed to be eavesdropping. Murray, a quietly intense Scotsman in his early 40s, was waiting with the tools of his trade laid out before him: two cameras and an array of lenses. I shook his hand with a tinge of nervousness. I was one of the first students of Wild Studio, a new course being offered by Great Plains Conservation, a tour operator focused on protecting and nurturing communities, wilderness, and wildlife in Kenya and Botswana. The following morning we were scheduled to leave Nairobi and spend three days at a safari lodge in the Chyulu Hills, then another three days among the spectacular animals of the Masai Mara. Murrays mission was to transform me from a virtual incompetent to an accomplished photographer. I wasn't sure whether either of us actually believed that this was an achievable goal. When he isn't teaching, Murray has a successful career as a photographer, working out of a studio in the north of England. His images of wildlife have been published widely and shown in several galleries in the U.K. He told me that he used to manage a luxury safari lodge in Botswana, where he often witnessed guests' frustration with their pictures. One inspiration for founding Wild Studio, he said, was seeing a visitor hurl down a $10,000 camera in a rage. As digital technology and social media have changed the way we take pictures, courses that turn bucket-list travel experiences into roving photography workshops have proliferated. Some bill themselves as boot camps and have a tough-talking, macho ethos. Murray, by contrast, tends to reference Zen and let sentences hang in the air half-finished. "My only stipulation is that you don't throw the camera at my head," he told me calmly. I explained to him that my feelings about photography are complicated. As a writer, I've worked on assignment with many professional photographers. The traits that make them good at their job — obsessiveness, tenacity, ratlike cunning, a willingness to wake before dawn — make them poor travel companions. Still, I envy them. There's a glamour and mystery about their work. When I travel with a photographer, people are always admiring the gear, asking about the lenses, and wanting to see the shots. No one has ever expressed an interest in my mechanical pencils or wanted a look inside my notebook. But then, no line I've ever written has had the impact of a great picture. The best photographs are like bottled lightning, capturing an extraordinary, unrepeatable moment. When I was in my teens, I owned a simple single-lens-reflex camera with interchangeable lenses. Today's digital SLRs have powerful autofocus, enormous storage capacity, and the ability to work in low light. The downsides — for me — are their perplexing vocabulary, stratospheric cost, and an intimidating appearance that makes my old 35 mm look more like a box Brownie. Murray spent that first afternoon familiarizing me with the Canon EOS 5D Mark IV and a Canon 7D Mark II he had brought with him. The camera bodies, with their countless buttons, were as complicated as I'd feared. We began with a crash course in exposure and focus. I thought I had a rudimentary understanding of these concepts and encouraged Murray to skip the preamble, but soon found myself baffled by the spinning wheels of shutter speed, aperture, and ISO. As Murray segued into a discourse on spot and evaluative metering, he must have sensed my gloom. "Or you can just keep it on that green button and fire away," he offered. In fairness to Murray, who is also happy to teach cell-phone photography, I had insisted on using professional equipment. The goal that I (and my editor) had set was to take pictures good enough to print in the pages of Travel + Leisure, without apologies or disclaimers, so I wanted to give myself the advantages of high resolution and great lenses. And Wild Studio does promise its students that by the end of the course they will be able to take publishable wildlife photographs. Some, Murray said, would even bag the most elusive quarry of all: an in-focus image of a bird in flight. 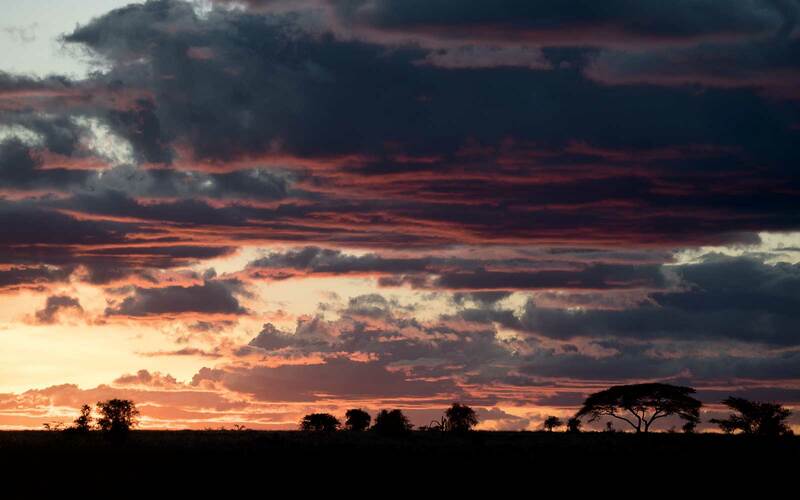 Sunset over the Mbirikani Group Ranch. Settings: 500 ISO, f/5.6, 1/500 second exposure. What I Learned: "This shot showed me the advantage of manual settings. Fully automatic would have overexposed the image and blown out the beautiful colors in the sky." The rhinos, giraffes, lions, and cheetahs of Nairobi National Park seemed too ambitious for my first-ever wildlife images, so to get used to the camera, I wandered around the grounds of the lodge snapping pictures of hyraxes, which look a bit like small woodchucks, on various settings. The equipment felt heavy and awkward, and I kept forgetting which button did what. Everything I shot on manual exposure was too dark. Several frames were completely black. In the end, I just hit the green button and took a perfectly exposed, in-focus shot of a hyrax on a paving stone. When we reviewed the pictures, Murray did his best to sound enthusiastic. But there was no disguising the fact that my most successful work so far looked like a poorly lit rat in a suburban garden. summit of Kibo, the highest of Mount Kilimanjaro's three peaks. I wondered how one could possibly render all of this in a photograph. No image, it seemed, could ever convey the immersive feeling of being in a tiny plane above this infinite velvet landscape. 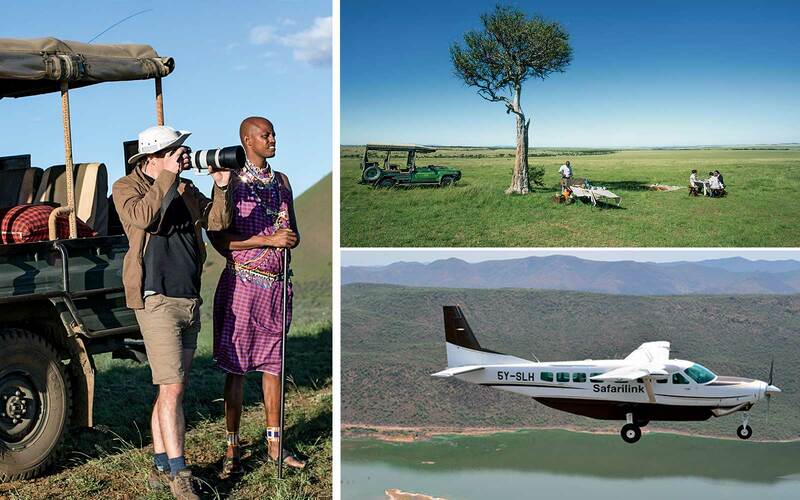 Clockwise from left: A picnic at Mara Plains Camp, on the northern edge of the Masai Mara; the author with Konee Kinyaku, a Masai guide from Ol Donyo Lodge; a single-engine Cessna flies between camps. We were met at the dirt airstrip by a Masai guide, Jackson Lemunge, who drove us to our lodge in an open safari vehicle. On the way, we stopped to watch zebras and giraffes lolloping across the plains. Behind them, Mount Kilimanjaro rose through a thin band of cloud. Murray explained that giraffes are hard to shoot well — their long necks mean they break the horizon awkwardly, causing difficulties with exposure. Further on, we stopped again to spy on two cheetahs resting in the shade of an acacia tree. I felt overwhelmed and a bit panicked by the sudden abundance of things to photograph, like a man who's gone to a banquet wearing an ill-fitting set of dentures and finds himself unable to chew. When we reached the lodge, I had barely dropped my briefcase before giraffes, zebras, and elephants began showing up at a watering hole outside my window. I spent the rest of the morning in a nearby blind, snapping away. I shot more than 500 images, which Murray and I painstakingly reviewed in the heat of the afternoon. I felt like I was going over a failed homework assignment. To my shame, my pictures of the cheetahs were underexposed and out of focus. "There's nothing you can do if the eye is blurry," Murray said. 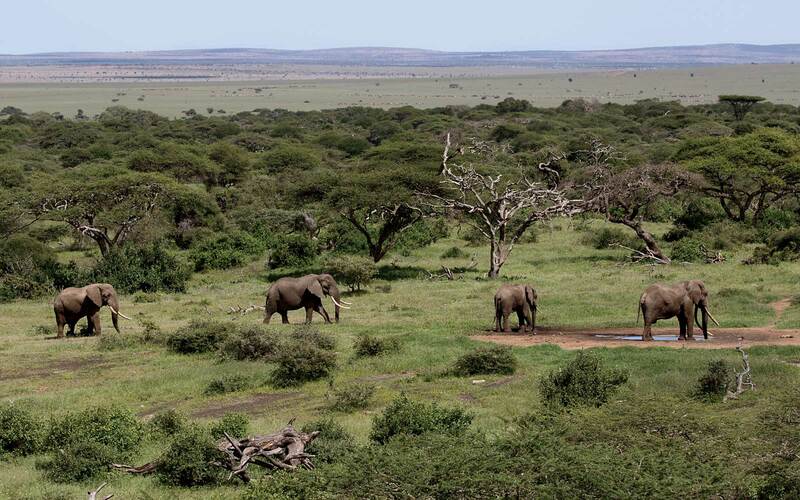 Elephants around the watering hole at Ol Donyo Lodge. Settings: 100 ISO, f/7.1, 1/400 second exposure. What I Learned: "I didn't even leave my room to make this one. I remember thinking, This isn't so hard! How often are photographers getting credit for Mother Nature's work?" My elephants were a little better. Murray nonetheless pointed out extraneous details that cluttered up the images. "There's this messiness here," he said, pointing to some thornbushes that appeared to be sticking out of one elephant's head. Particularly bruising was my failure to do justice to a wonderful moment when four elephants arrived together at the watering hole. A hard thing to ruin, you'd think. But somehow the two elephants in the center were tangled up in a way that the eye struggled to decode. "When are three elephants better than four elephants?" Murray mused, as though it were a Zen koan. But he was smart enough to season his criticisms with praise. My heart swelled with pride when he described one of my shots as "well framed." "That's brilliant," he said of another, "and it doesn't matter that the tusk is cut off there." That evening, I sat in my room playing with the buttons on the camera, resetting the exposure and focus, like a rookie gunslinger practicing his draw. The lodge staff had made up a bed on the roof, and I slept outside under a mosquito net, looking up at the smear of the Milky Way. The night was clear and windy. As I drifted off to sleep, the stars above made me think of blinking camera settings. I was up at 4:30 the following morning. Murray doesn't insist that his guests get up early — they're supposed to be on vacation, after all. But the light is better and the animals more active at this hour, and I could tell that Murray approved of my keenness. Our guide, a tall Masai man in his early thirties named Konee Kinyaku, arrived in a red cotton shuka and beaded anklets to drive us out across the plains in the darkness. The light had just begun coming up, as though on a dimmer switch, infusing the pale predawn gray with a warm, peachy glow, when Kinyaku spotted a pride of young lions breakfasting on a wildebeest. 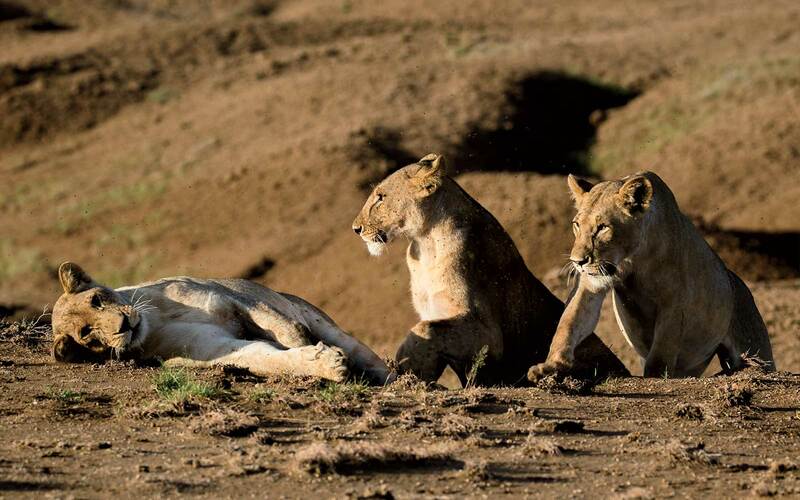 Three young female lions soak up the dawn rays at Mbirikani Group Ranch. Settings: 125 ISO, f/5.0, 1/400 second exposure. What I Learned: "This shot took some effort and patience. I remember an intoxicating sense of excitement as we stalked the lions." By now, I felt more confident handling the camera. The hours of practice had made me more technically adept, and the picture review had given me a greater awareness of the importance of composition. Murray had spoken a lot about the rule of thirds — how an image is more intuitively pleasing if key elements are placed on the intersecting points of an imaginary grid. I tried to visualize the frame divided into horizontal and vertical bands, and to locate my subjects at the intersection of these bands. Kinyaku, a photographer himself, was attuned to the position of the light and kept moving the vehicle to optimize it. A female lion lay in a dusty fold of a low, ocher valley. Soon a second joined her, and then a third. I snapped away, consciously trying to simplify the shot. I was so involved in what I was doing that it never occurred to me to be concerned about the lions, who were only a few yards away. Suddenly, they moved upwind of us, their pungent, meaty stink blowing into the open vehicle like a draft from a hot butcher's shop. I broke off from taking pictures with a vague sense of disquiet. "They are surrounding us," said Kinyaku, drily. One met my gaze with an unfathomable orange stare before padding off into the bush. Reviewing that morning's images, Murray was generous with his praise. "The progression of perfect exposures is unbelievable," he told me. I felt exhilarated. I'd snapped more selectively, taking far fewer pictures but vastly better ones. Of course, I couldn't take all the credit. It was Kinyaku who had found the lions and maneuvered the vehicle. Murray, like a ring cornerman, had fed me technical suggestions. But I felt proud of myself for the small decisions that had culminated in these photos. We flew next to the Masai Mara, the vast grasslands in the south of Kenya, for the final portion of the course. This is the setting for the annual migration of 2 million wildebeests, which move in search of fresh pasture. Here and there, a bleached skull in the grass showed where a wildebeest had fallen to a predator. As hunters of a more benign kind, we settled into a daily routine: game drives in the early morning and evening with our local guide, Edwin Senteu; picture review in the afternoon. Now, when Murray and I discussed my efforts, we were having higher-order conversations about the way images impart meaning. We'd flip through a coffee-table book and talk about the difference between generic shots of animals — images that might illustrate a zoology textbook — and pictures with poignancy and emotion, in which an animal's pose hints at its life beyond the frame. Murray pushed me to think about the way the angle of the shot affected a viewer's relationship with the subject: "Too high and it looks like you're dominating the animal," he said. "Like you have no connection to it." I tried to remember this advice at dawn the next day, when we came across another pride of lions. Senteu counted four females, two males, and 10 cubs. I crouched on the floor of the vehicle, so as to put myself on their level and enter their world: an adult male and female waking and sniffing each other amorously; the cubs lying in wait to attack their parents; a half-grown male, like a gangly teenager, goofing off with his younger siblings. A female leopard in the Masai Mara at dusk. Settings: 6400 ISO, f/5.6, 1/500 exposure. What I Learned: "At first I grumbled about the acacia branches in her face and the drab light on her fur. Now I think he blocked view gives her a kind of mystique and danger." Though I still hadn't mastered the camera, I no longer fumbled to change my settings, and I felt I was gaining an intuitive sense of which aperture and shutter speeds were appropriate for each situation. As my competence grew, however, so did my ambition. I noticed myself taking on some of the restless perfectionism that is one of the defining traits of a photographer. The light could always be better, the animals closer, the cubs cuter. A pride of lions frolicking in the dawn air on the Masai Mara is something I'd ordinarily feel privileged to witness. Now I was quibbling about the placement of the acacia trees, the unwanted shadows, and the overcast sky — the light, I knew, would never have the honeyed quality that photographers covet. I told Murray about my newfound discontent. "You know what makes the best photographer?" he asked. "Insecurity." It struck me that the cosmic ingratitude of photographers has become a common affliction among all travelers. We're increasingly unable to appreciate what we've got, for fear of missing something better. At least I was able to redeem my bad cheetah photographs. As the sun set, Senteu found a female stirring in the shade of an acacia tree, casting a hungry eye at a herd of impalas. While I waited for her to emerge into the sunlight, I watched the rise and fall of her breath, the way she sprawled in the dust, yawning, then set off hungrily, with a relaxed, swaying walk, displaying the unmistakable intent of a hunter. 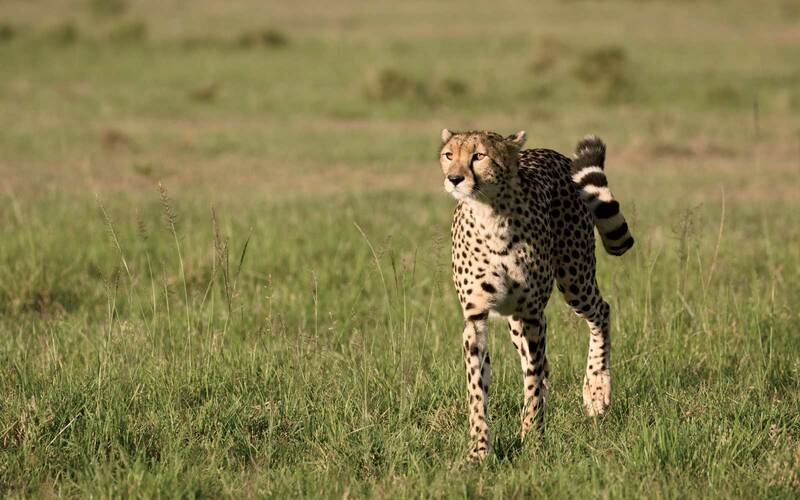 A female cheetah on an afternoon hunt in the Masai Mara. Settings: 400 ISO, f/5.0, 1/1000 exposure. What I learned: "The way it's framed gives you the senes that her prey is just out of the shot to the left." My picture-taking, I realized, was altering the way I saw the world. Looking at an elephant, I noticed symmetry and asymmetry, the saggy heft of its trunk, the way it flapped its ears and dribbled water, the blue butterflies twinkling in the air around its face. Trying to be a photographer was making me a better observer. That last evening, driving back across the plains, we came across a tiny, rainbow-colored bird perched on a hillock: a lilac-breasted roller. I'd tried and failed a dozen times to capture the moment a bird took flight, framing my shots too tight, losing patience, or just blinking and missing the moment. This time I was determined to get it right. Senteu stopped the vehicle and killed the engine. "One two-thousandth shutter speed, f-stop eight, one thousand ISO," Murray whispered. I focused on the bird, gulped, and waited. I wasn't even aware of the moment it moved. At some point, I must have pressed the shutter, because the viewfinder blacked out. When I looked again, the bird was gone. "Never mind," Murray said. Expecting nothing, I reviewed the images. There they were: five shots of a bird taking wing over the Masai Mara. After passing my camera around for everyone to admire the pictures, I folded my arms behind my head and savored the sweet but fleeting sensation of photographic satisfaction. Marcel Theroux was born in Uganda and raised in England, where he now lives. He has hosted numerous documentaries for British television and written six novels, including The Secret Books, published this year. Fly to Nairobi's Jomo Kenyatta International Airport via a connection in a number of international hubs, including London. Great Plains Conservation: The eco-tourism specialist's Wild Studio photography course includes three days of mentoring from a professional photographer, as well as lodging — all of which is owned by the company — and meals. three nights from $2,412. The Emakoko: A 10-room safari lodge on the edge of Nairobi National Park, the property is 45 minutes from Nairobi airport — making it the perfect place to begin or end a visit to Kenya. doubles from $780. Mara Expedition Camp: Sitting on a bend of the Ntiakitiak River, this tented camp was designed to have minimal impact on the environment. Sit back and unwind in a hammock with a copy of Out of Africa, which was set nearby. ; doubles from $1,000. Mara Plains Camp: A luxury tented camp done up in grand, nostalgic style — think Downton Abbey on safari. At night, head to the outdoor dining room, where the food is healthful, fresh, and vegetable-forward. doubles from $1,760. Ol Donyo Lodge: This property, near Chyulu Hills National Park, was made from lava rock and has views of Kilimanjaro. doubles from $1,600. Join fine-art photographer David Yarrow aboard Natural World Safaris’ superyacht bound for the South Atlantic island of South Georgia. He’ll offer passengers instruction and advice on a 15-day journey to capture images of penguins, seals, and seabirds. Nov. 2018; from $43,400. Learn how to photograph the elusive aurora borealis on Gondwana Ecotours' six-night trip, which also includes showshoeing, dog-sledding, and dips in geothermal hot springs. Feb. and March 2018; from $2,545. On this eco-minded trip from Natural Habitat Adventures, skilled photographers assist travelers in documenting sloths, monkeys, crocodiles, and hundreds of species of birds. Jan., Feb., and Dec. 2018; from $4,300. American husband-and-wife photography team Elia and Naomi Locardi give hands-on tutoring to guests of Dream Photo Tours' 13-day exploration of Tokyo, Kyoto, Osaka, and other cities when Japan is in bloom. March 2018; from $7,500. Joined by a professional photographer, guests of the Four Seasons Hotel Ritz Lisbon can hop on a vintage motorcycle with a sidecar and speed through the city’s cobblestoned streets, making pit stops at iconic sites like the Alfama and Bairro Alto districts, while receiving insights on how to shoot them effectively. year-round; from $658 for two people.